The white wines of Bordeaux are rare when compared to the regions production of red wines, but this has not done anything to deter producers from making the very best, with price tags to match. The whites of Bordeaux come in a huge range of styles; from the everyday drinking dry Sauvignon Blanc varietals, to unctuous dessert wines. Bordeaux’s sweet wines of Sauternes are among the world’s most famous dessert wines and, due to the high sugar content, are almost immortal if properly stored. We stock highly collectable older vintages of wines such as Château d’Yquem and Château Climens in a variety of formats, together with younger wines from a range of producers. 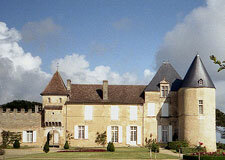 The finest of Bordeaux’s whites are from Graves and its sub-region Pessac-Légonan. Typically with a cépage of Sémillon and Sauvignon Blanc, these wines are range from fresh and fruity to long-lasting wines. Our range is consistently good and great value for money, from top Pessac estates such as Smith Haut Lafitte and Pape Clement.